Most Christchurch residents feel upbeat about the central city. The Life in Christchurch 2018 survey shows that 75 per cent of respondents agree that the area provides a range of shops, services and entertainment - a 13 per cent jump on the previous year. Residents’ approval of the range of restaurants, cafes and bars opening up in the CBD has also risen to 89 per cent, up 4 per cent on 2017. 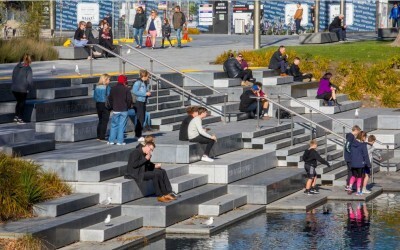 The survey – commissioned by the Christchurch City Council – seeks feedback on key aspects of city life to help identify trends and changes. In all, 3100 responses have been collected from a range of people and communities. Christchurch City Council Chief Executive Karleen Edwards says the survey shows that residents’ perceptions of the central city are improving greatly. “Increasingly, people are enjoying the central city as they embrace the flourishing entertainment scene, complemented by a vast array of restaurants and bars – and plenty of new shops,” Dr Edwards says. The annual survey also points to fewer people using a car to travel to work, the shops and social and recreational activities. In 2018, 41 per cent of respondents use a car to travel to work compared with 54 per cent last year. Residents have also cut their car use for shopping and activities to 65 per cent, compared with 76 per cent and 78 per cent, respectively. Residents agree it is much easier to cycle in the city – up 7 per cent on last year – or walk, up 6 per cent to 70 per cent. They also agree that the central city is safer for cyclists, up 6 per cent; and pedestrians, up 9 per cent. The “look and feel” of new buildings, streetscapes and open spaces have won widespread approval. The satisfaction rating for new buildings has risen to 64 per cent while 59 per cent of respondents are happy with the streetscapes and open spaces. “These results show that we are all contributing to making Christchurch one of the best places to live, work and play,” Dr Edwards says. "In time, I can see that it is going to be magical (to cycle through the city)." "I go into the city to explore the different types of shops from the malls, and love going to the different types of eating places. Little High is a firm favourite." "The central city is on track to provide a good range of recreation opportunities, shops, entertainment and cafes." "The Margaret Mahy playground is fantastic and people are always playing basketball at the basketball hoop, which my husband said would never be used. He was wrong and knows it."